Clarity Connect offers an array of reports capturing data on contact center performance, agent performance, call flows, and more. Historical performance reports are stored here and are available to users depending on their authorizations (Figure 1). You must configure reports before using them. See Report Configuration for more information. To view information on report troubleshooting, see Clarity Connect knowledge base articles in the Support Portal. All reports are based on current configurations for business units, teams, and groups. Durations and averages are rounded to the nearest second. Time is formatted as hh:mm:ss, where hh (hours) may be greater than 24. For instance, a time period of five days, two hours, 30 minutes, and 15 seconds will be shown as 122:30:15. When viewing a row of data, sometimes values do not sum up exactly. For example, a single call that had 30.4 seconds of talk time and 20.4 seconds of after call time would display as having 00:00:30 talk time, 00:00:20 after call time, and 00:00:51 (50.8 seconds rounded up) handle time. For reports that include start time and end time as parameters, Clarity Connect includes data between the start time and end time on each day (in the selected time zone) for each date in the selected range. The M_IncludeIncompleteDOD config value impacts the DirectOutboundCall count in the FactAgent table. If this config value is set to False, incomplete direct outbound dial sessions will not be counted toward the agent's direct outbound dial count. The wrap-up agent is changed for a cold transfer, completing a consult (warm transfer), and transferring a session to an invitee. The wrap-up agent is not changed for a re-enqueue, however. # of Calls and Your # Handled counts for transfer target agents are not incremented by transfers. Transfers are not counted as extra queued calls or answered calls in any reports. Any transfer creates an Agent Participation for the transfer target agent; detailed information on this is available on the Session Search page of the website. Re-enqueue is a special transfer that creates an entirely new session with the caller. The new session is assigned to the chosen queue. The existing session is then closed. Transfer to voice mail sends a session directly to an agent’s voice mail; the agent that receives the voice mail does not become the wrap-up agent or get any talk time for that session. If any type of transfer to a contact is performed and that contact is also an agent, Connect will treat that as an agent transfer. Transfers to non-agents and PSTN numbers are treated as if the call has been transferred out of the system. 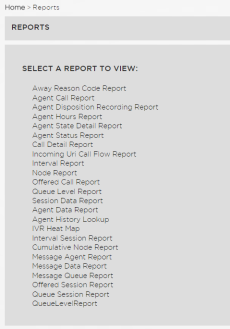 Agent level reports include the Agent Call Report, Agent Disposition Recording Report, Agent History Lookup Report, Agent Hours Report, Agent State Detail Report, Agent Status Report, and Away Reason Code Report. This report provides an overview of an agent’s activity for both voice and IM sessions over a selected time period, including metrics such as session count, session time, unique dials, escalations, handle time, and more. Parameters include start date, end date, start time, end time, time zone, business unit, group, team, and agent. Direct inbound or direct outbound indicates the call was proxied through Clarity Connect (to or from the agent’s extension or SIP address) and was not routed via the IVR queue. Clarity Connect does not require agents to execute distinct log on and log off actions to become available to take calls or to go “off phone.” Because of this, log on and log off times are based on the agent’s Skype for Business presence and/or lack of activity. Rarely, this will lead to the report displaying an inaccurate number of days under the Work Days column. The agent’s first and last name. The number of days the agent was “seen” by the system. 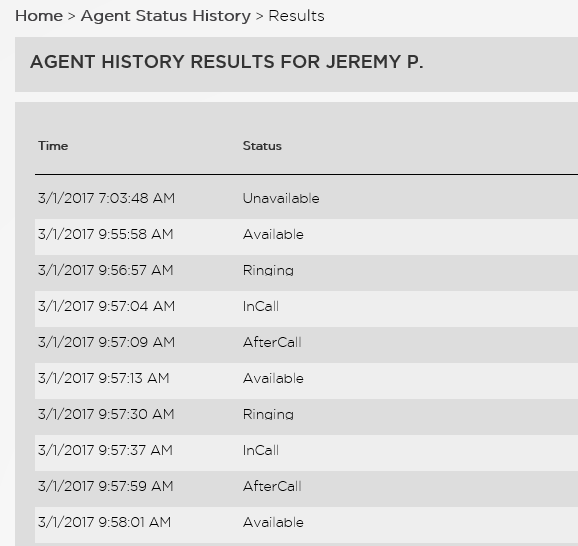 The duration of calls directly to the agent that were proxied through Connect. The number of calls directly to the agent that were proxied through Connect. The duration of calls dialed by the agent that were proxied through Connect. The number of calls dialed by the agent that were proxied through Connect. The duration of Connect voice calls that were not direct inbound or direct outbound. This includes the chat time for escalated calls. The number of Connect voice calls that were not direct inbound or direct outbound received by the wrap-up agent. This includes sessions escalated from chat to voice. The number of Connect calls escalated from chat only to voice. The average interaction time for queued, direct inbound, and direct outbound voice calls. This includes the talk time for voice calls and the chat plus talk time for chats that were escalated to voice calls. This is a queue-level calculation. Average handle time for queued, direct inbound, and direct outbound voice calls. This includes the talk time for voice calls and the chat plus talk time for chats that were escalated to voice calls, as well as the after call work time. This is a queue-level calculation. Average after call work time for queued, direct inbound, and direct outbound voice calls. This is a queue-level calculation. The number of unique customer PSTN or SIP addresses for queued, direct inbound, and direct outbound voice calls. The number of queued, direct inbound, and direct outbound calls longer than 90 seconds. The number of queued, direct inbound, and direct outbound calls longer than 120 seconds. The duration of Connect chat sessions. The number of Connect chat sessions. The average chat time for Connect chat sessions. The average handle time for Connect chat sessions. This includes the chat time plus the after call work time. This is a queue-level calculation. The average after call work time for Connect chat sessions. This is a queue-level calculation. This is a compliance report designed to use with agents who are required to enter dispositions for each session. This report identifies both the number and percentage of voice and IM sessions the agent entered dispositions for. The Agent Disposition Recording Report displays the number of sessions for which an agent was the wrap-up agent and the number of calls for which a call disposition was set from the Agent Console (or shortly after the session completes from the Session Search page). Information for sessions where the agent was just the responding agent or involved in a consult are not included in this report as it is the responsibility of the wrap-up agent to set a call disposition. The number of Connect calls the agent has taken, both queued and direct, for both chat and voice. The number of Connect calls the agent has taken, both queued and direct, for both chat and voice that were assigned a disposition. The percentage of the agent’s calls that were assigned a disposition. This report provides a complete history of an agent's status changes for a selected time period. Parameters include start date, end date, and agent. Select a date range for the report, select an agent, and then click Search (Figure 2). A complete history of the agent's status changes appears for the selected time period (Figure 3). This report provides a short summary of an agent’s work day, broken down by time spent available, in a call, busy, and away, as well as when the agent logged in and logged out of Clarity Connect. Work Hours are calculated as the lessor of either the first status that indicates the agent is present until the last status that indicates the agent is present OR a summation of all statuses that indicate the agent is present. This is done in order to more accurately account for agents logging back on late at night or agents not logging out of their system at night, so their presence remains in an Away state for an extended period. 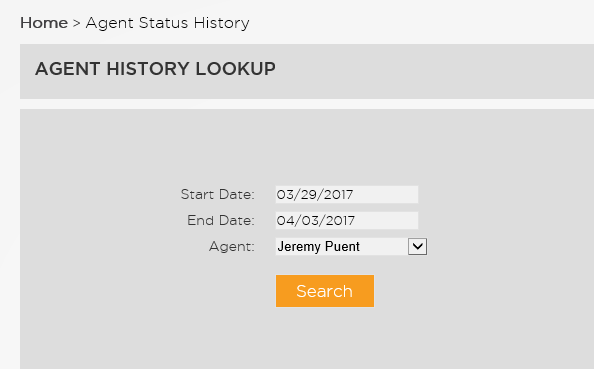 The Agent Hours Report is based on an agent’s Agent Status. In a Call time includes any time the agent was in any type of session during the report timespan. A call initiated before the set time span and continued into the time span will add to the In a Call time. The Available, In a Call, Busy, and Away Time columns display the time in each status for the selected duration of the report. The date the row summarizes. The number of hours the agent worked. This is calculated by adding the following: AvailableTime, AfterCallTime, DirectCallTime, CallTime, ConferenceCallTime, RingingTime, BusyTime, RonaTime, UnavailableTime, and OffWorkTime. The amount of time the agent was in an Available presence state. The amount of time the agent was in a call of any type. The amount of time the agent was in a Busy presence state. The amount of time the agent was in an Away presence state. The time of the first status indicating the agent was present. The time of the last status indicating the agent was present. This report shows every state change an agent went through in a given interval, including the away reason code he or she supplied (if entered). This report does not display any state changes lasting fewer than 0.5 seconds. All state change durations are rounded to the nearest second. When the agent’s presence state changed. The name of the presence state the agent was in (Available, In Call, Away, Busy, Direct, DID, DOD, etc.). The away reason code provided. This column is only populated for Away presence states. If the agent did not provide an away reason code, this column will be blank. How long the agent was in this presence state. This report groups agents by team and includes the number of answered sessions, a breakdown of each answered session, and a summary of team performance versus individual agent performance. Answered voice counts may include queued, direct inbound, and direct outbound calls. If the agent answers an IM session and escalates it to voice, it will count as one answered chat and one escalation. On phone time, chat time, and talk time include all time an agent was in a session with a customer, including consultations and invitations, even if that session was active before the set reporting time frame and carried over into the beginning of the set time frame. An agent can never have more chat minutes than logon minutes, even if handling multiple IMs at once. Handling two IMs simultaneously that both take five minutes is counted as five minutes of chat time—not ten minutes. Occupancy rate measures the percentage of time an agent handles customer calls. Occupancy does not distinguish between how many calls are being handled at once. Handling one call for ten minutes out of 100 logged on minutes counts as a 10% occupancy rate. Handling two calls simultaneously for ten minutes out of 100 logged on minutes also counts as a 10% occupancy rate. The name of the team the agent belongs to. This is aggregated with a subtotal for all agents on that team. The number of chat sessions the agent answered. The number of audio calls the agent answered. The number of chat sessions escalated to voice sessions. The number of calls and chats from the queue (and consult/invite requests, if configured) the agent missed. The amount of time the agent was available to take a session or was actively handling a session. The amount of time the agent was only in a chat or multiple chats. The agent’s chat time includes the time when a session was just a chat, even if that session was later escalated. The amount of time an agent was in a voice call managed by Connect (queued call or direct call that was proxied). The agent’s talk time includes the time after a chat is escalated to voice. The amount of time the agent spent in after call work. The amount of time the agent was available to take a call but was not actively on a call. The amount of time the agent was in a direct call that was not proxied through Connect. The amount of time an agent was logged in but in an Away presence state. The agent’s occupancy rate. This is calculated as Handle Time divided by On Phone Time. The agent’s chat rate. This is calculated as Chat Time divided by On Phone Time. The agent’s talk rate. This is calculated as Talk Time divided by On Phone Time. The agent’s after call work rate. This is calculated as After Call Time divided by On Phone Time. The agent’s idle rate, or the percentage of time he or she was in a position to take a session but did not have one. This is calculated as Available Time divided by On Phone Time. The agent’s unavailable rate. This is calculated as Unavailable Time divided by On Phone Time. This report breaks down how much time an agent spent in each session status per 15 minute interval. The start date and start time (in 15 minute intervals). The end date and end time. The sum of time the agent was logged on during the interval (including time spent in Available, After Call, Direct Call, Direct Inbound, Direct Outbound, Conference Call, Ringing (reserved), Busy, RONA, In Call, In IM Call, and any Unavailable (Away) time, including away time with an associated away reason code. The sum of time the agent was working (logged on) but not ready to take incoming Clarity Connect calls. This includes time spent in Unavailable (away) with or without an away reason code, in addition to After Call, RONA, Busy, Conference Call, Direct Call, Direct Inbound, and Direct Outbound. Unavailable time is a subset of Work Hours. The amount of time the agent spent in ring on no answer. The amount of time the agent spent in a Busy presence state. The amount of time the agent spent on direct calls that were not proxied through Connect. The amount of time the agent spent on direct inbound calls that were proxied through Connect. The amount of time the agent spent on direct outbound calls that were proxied through Connect. The amount of time the agent spent in non-Clarity Connect conference calls. The amount time the agent spent in an Away presence state with a reason code of At Lunch. The amount of time the agent spent in an Away presence state with a reason code of On Break. The amount of time the agent spent in an Away presence state with a reason code of In A Meeting. The sum of all times an agent was in an Away presence state with a custom reason code. The time in this column should be the difference between the preceding columns and the total Not Ready time. Queue level reports include the Queue Call Detail Report, Queue Level Report, and Queue Session Report. This report displays information about each session that went through Clarity Connect. Parameters include start date, end date, start time, end time, time zone, business unit, group, team, and queue. The Clarity Connect session ID for the interaction. The time the interaction was initiated. The address of the outside party participating in the interaction. The queue the session was placed in. The responding agent that handled the session. This value will be left blank for queue abandon sessions. Chat or audio. A chat that escalated to a voice session will display as Audio. Escalated flag. The flag will display as “Y” if the call was escalated to a voice session from a chat session. The type of session: direct inbound dial (DID), direct outbound dial (DOD), or IVR queued call (IVR). The amount of time the call spent in the automated IVR attendant. The amount of time the call spent in queue waiting for an agent to become available. The amount of time the agent took to accept the call or chat session. The amount of time the agent was instant messaging with the caller. The amount of time the agent was speaking with the caller. An escalated call will display both chat and talk time. The amount of time the agent spent on after call work following the session. This report is designed to allow supervisors to drill down into queues to identify the topic of calls (if disposition is set by agent) and various metrics for each type of call that came in through the IVR. This report is designed for contact centers that only handle voice calls. The data for chats will not be displayed in this report. Use the Queue Session Report instead. The disposition the agents applied to the calls within this grouping. The sub-disposition agents applied to the calls this row represents. The number of calls that were placed into queue to wait for an agent. The number of calls the customer abandoned while waiting in queue for an agent. The number of calls where the customer was transferred out of the portal while waiting in queue. The number of calls answered by an agent. The percentage of calls answered within the configured time allotted in the service level agreement. Average Speed of Answer. The average amount of time it took for an agent to be connected to a call after it entered a queue. This is a queue-level calculation. Abandon Rate. The percentage of queued calls that were abandoned before being connected to an agent. This is a queue-level calculation. The longest time a caller spent waiting in queue for an agent. Average amount of talk time for all answered calls. Average amount of after call work for all answered calls. Average handle time for all answered calls. This is calculated as (Talk Time + ACW Time) divided by Answered Call Count. This is a queue-level calculation. The total amount of time spent on calls that came in from an IVR queue. This report allows supervisors to drill down into queues to identify the topic of sessions (if disposition is set by the agent) and various metrics for each type of session encountered that was not a direct proxied session. This report is designed for contact centers that handle both voice calls and chats. Data is grouped by disposition, then sub-disposition, and finally by modality. The disposition agents applied to calls within this grouping. Voice or chat. Escalated calls will display as Voice. The number of IM sessions escalated to voice sessions. The average amount of interaction time for all answered calls. This is calculated as Chat Time + Talk Time. Average Handle Time for all answered calls. This is calculated as (Interaction Time + ACW Time) divided by Answered Call Count. This is a queue-level calculation. The total amount of handle time spent on calls that came in from an IVR queue. This is calculated as Talk Time + After Call Work Time. This is a queue-level calculation. Message level reports include the Message Agent Report, Message Data Report, and Message Queue Report. This report allows supervisors to identify all messaging metrics at an agent level. Data is grouped by agent. Parameters include start date, end date, start time, end time, time zone, business units, group, teams, and agents. The number of e-mails offered to the agent. The number of e-mails accepted by the agent. The number of e-mails ignored or declined by the agent. The percentage of e-mail responses sent by the agent, marked as “completed” and re-opened for additional follow up. The average number of replies the agent sent per session he or she worked with (not including other agents’ replies to that session). The total amount of time within business hours where the agent had at least one e-mail that was accepted but not responded to. The number of sessions the agent accepted and then transferred to a different agent or queue. This report shows every message that went through Clarity Connect, giving customers a complete view of information that can be aggregated and summarized using whatever technology is most familiar (Excel, MatLab, etc.) if Clarity Connect’s standard reports do not provide the desired data or aggregation type. Every message session that goes through Clarity Connect contains a line on this report. The columns provide information to assist in filtering and summarizing as needed. Parameters include start date, end date, and time zone. The session ID of the corresponding session represented in this row. The e-mail address the first message was sent from. The e-mail address the first message was sent to. The time the first e-mail arrived. This is in the selected time zone. The time the last reply tagged with “completed” was sent or the time the session was closed (if manually closed without a “completed” reply). The calendar duration between the start time and end time. Whether or not the first e-mail an agent responded to (counting the duration within business hours) was within the SLA time. The queue the session was initially placed in. The queue the session was in when it was closed. All queues the session passed through. The average amount of time within business hours a session was waiting in queue before an agent accepted an offer to handle the response. The agent that accepted the session’s first e-mail. The agent who marked the session as “completed” when it was closed or the agent who was last assigned to the session before it was closed. All agents who interacted with the session. The maximum time within business hours between when an agent responded with “waiting” or “completed” and the customer responded before the ticket closed. The number of e-mails received from the customer over the duration of the session. The average time within business hours between when an agent responded with “waiting” or “completed” and the customer responded before the ticket closed. The number of e-mails sent by the agent to the customer over the duration of the session. The maximum amount of time within business hours a session was waiting in queue before an agent accepted an offer to handle the response. The total amount of time within business hours a session was waiting in queue before an agent accepted an offer to handle the response. The number of times a session was waiting in queue. The number of times an agent accepted an offer to respond to a customer message relating to this session. The total time within business hours between when an agent responded with “waiting” or “completed” and the customer responded before the ticket closed. The number of times an agent replied indicating he or she was “waiting” for a response or indicated “completed” and the customer responded before it closed. This report is designed to allow supervisors to identify all messaging metrics at a queue level. Data is grouped by queue. Parameters include start date, end date, start time, end time, time zone, business units, group, teams, and queues. The name of the queue the session came through. The number of new e-mail sessions received. The number of replies received to existing e-mail sessions. The number of existing e-mail sessions transferred into this queue from a different queue. The number of offers for e-mail sessions in this queue that were accepted by an agent. The number of e-mail sessions that were responded to with “completed” and were not reopened or were manually closed. The percentage of sessions where the agent responded in any way to the first e-mail (counting the duration within business hours) within the SLA time. The highest maximum queue time for e-mail sessions, as defined in the e-mail data definition. The average queue time for e-mail sessions, as defined in the e-mail data definition. The highest maximum active time for e-mail sessions, as defined in the e-mail data definition. The average active time for e-mail sessions, as defined in the e-mail data definition. The highest maximum waiting time for e-mail sessions, as defined in the e-mail data definition. The average waiting time for e-mail sessions, as defined in the e-mail data definition. The highest total time for e-mail sessions, as defined in the e-mail data definition. The average total time for e-mail sessions, as defined in the e-mail data definition. System Level Reports include the Agent Data Report, Incoming URI Report, Interval Report, Interval Session Report, Node Report, Offered Call Report, Offered Session Report, Quick IVR Heatmap, and Session Data Report. This report provides customers with a data dump of information that can be further aggregated and summarized using whatever technology is most familiar (Excel, MatLab, etc.) if Clarity Connect’s standard reports do not provide the desired data or aggregation type. This report provides data for the selected time periods (year, month, week, day, hour, quarter-hour) for each configured agent with a variety of information about that agent’s activities during that period of time. Parameters include start date, end date, time zone, and group by. The start date for the selected timespan. The start time of the selected timespan. The business unit associated with the agent’s team. The team the agent is associated with. The group(s) the agent is associated with, if any. The number of queued sessions the responding agent was offered and accepted. The number of session invites the agent missed. The number of direct inbound dial calls the agent received, whether or not they were answered. The number of direct outbound dial calls the agent initiated. The number of IM sessions the agent initiated. This only includes IM sessions answered from the queue. The number of voice sessions the agent initiated. This includes calls answered from the queue, IM sessions escalated to include voice, and direct inbound/outbound dials. The number of IM-only sessions the agent handled that escalated to include voice. The number of session invitations the agent answered, including invites from a consultation. The number of session consultations the agent answered. The number of session transfer requests the agent answered, including transfers initiated from an invite or consultation. The number of sessions the agent joined using either silent or whisper join. The amount of time the agent was available to receive Connect sessions. The amount of time the agent had a call ringing to them. The amount of time the agent spent in IM-only sessions. The amount of time the agent spent in audio/video sessions. The amount of time the agent spent in proxied direct inbound calls. The amount of time the agent spent in proxied direct outbound calls. The amount of time the agent spent in a Skype for Business presence indicating they were in a direct call but did not have an associated Connect session. The amount of time the agent spent in either automatic or manual after call time to wrap up a session. The amount of time an agent spent in a RONA status after missing a session invitation before changing his or her Skype for Business presence back to Available. The amount of time an agent spent in an Away or Idle Skype for Business presence state. The amount of time an agent spent in an Off Work Skype for Business presence state. The amount of time an agent spent logged off of Skype for Business. The amount of time an agent was either interacting with a Connect session or was available to interact with a Connect session. This includes Available, Ringing, In Queued Call (IM or voice), In Direct Call, and in After Call status. The amount of time an agent was either interacting with a queued Connect session or was available to interact with a queued Connect session. This includes Available, Ringing, In Queued Call (IM or voice), In Direct Call, and in After Call status. The amount of time the agent was actively interacting with the customer in a Connect session. This includes In Queued Call (IM or voice) and In Direct Call. The amount of time the agent was actively interacting with the customer in a Connect session. This includes only In Queued Call (IM or voice). The amount of time the agent was in the process of handling a Connect session. This includes Ringing, In Queued Call (IM or voice), In Direct Call, and After Call Work. The amount of time the agent was in the process of handling a Connect session that came through the queue. This includes Ringing, In Queued Call (IM or voice), and After Call Work. The agent’s queue occupancy rate. This is calculated as Queue Handle Time divided by On Phone Time. The agent’s talk rate for the time period. This is calculated as Talk Time divided by On Phone Time. The agent’s talk rate for the time period. This is calculated as Queue Talk Time divided by On Phone Time. The average amount of time per session the Agent spent actively interacting with a customer. Because this is based on the number of answered calls in the time period, it will be more accurate for larger time ranges (i.e., a full day or longer). The average amount of time per session the agent spent actively interacting with a customer who came through the queue. Because this is based on the number of answered calls in the time period, it will be more accurate for larger time ranges (i.e., a full day or longer). The average amount of time per session the agent spent in after call work. Because this is based on the number of answered calls in the time period, it will be more accurate for larger time ranges (i.e., a full day or longer). The average amount of time per session the agent spent in after call work for a session that came in through the queue. Because this is based on the number of answered calls in the time period, it will be more accurate for larger time ranges (i.e., a full day or longer). The average amount of time per session the agent spent handling the session, including both actively speaking with the customer and in after call work. Because this is based on the number of answered calls in the time period, it will be more accurate for larger time ranges (i.e., a full day or longer). The average amount of time per session the agent spent handling the session, including both actively speaking with the customer and in after call work for sessions that came in through a queue. Because this is based on the number of answered calls in the time period, it will be more accurate for larger time ranges (i.e., a full day or longer). This report details calls that came into each call flow and mapped URI. It can help determine which call flows and URI mappings are used most often, as well as help identify potential areas of improvement by identifying call flows with high abandon rates or long durations spent in IVR. For this report, data in Clarity Connect 3.2 was aggregated by session. In Clarity Connect 4.0, data is aggregated by call flow node broken down by incoming URI. Because this data cannot be migrated from 3.2 to 4.0, legacy data, while still present, will display an incoming URI of “UNKNOWN.” Be sure to export any 3.2 reports with this information prior to upgrading to 4.0. Parameters include start date, end date, start time, end time, time zone, incoming URI, and call flow name. The name of the active call flow with revision number. The incoming URI called by the customer. The total number of calls placed to the incoming URI and handled by the call flow. The average amount of time calls spent in the call flow. This is calculated as the Total Call Flow time divided by Total Calls. The average amount of total call time. This is calculated as the Total Call Time divided by the Total Calls. The percentage of calls abandoned. This is calculated as Calls Abandoned * 100 divided by Total Calls. The percentage of calls placed into queue. This is calculated as Calls Queued * 100 divided by Total Calls. The percentage of calls transferred out of the call flow. This is calculated as Calls Transferred * 100 divided by Total Calls. The percentage of calls disconnected by the call flow. This is calculated as Calls Ended * 100 divided by Total Calls. This report shows the load experienced throughout the day and it impacts a variety of metrics. Parameters include start date, end date, start time, end time, time zone, business units, groups, teams, and queue. The start time of the 15-minute interval this row represents. The number of calls placed into a queue to wait for an agent. The number of calls abandoned. The number of calls transferred from queue hold, which does not include IVR transfers. The number of call connected to an agent, including from queues and direct proxied calls. The percentage of calls answered within a configurable time allotted in the configured service level agreement. The average speed of answer for calls answered. This is a queue-level calculation. The percentage of abandoned queued calls. This is a queue-level calculation. The average time to abandon for calls waiting in queue. Average handle time for all answered calls. This is calculated as Talk Time + After Call Work time divided by Answered Call Count. This is a queue-level calculation. The total amount of handle time for calls. This report shows the load experienced throughout the day and how it impacts a variety of metrics. The number of calls connected to an agent, including from queues and direct proxied calls. The average amount of interaction time for all answered session. This is calculated as Chat Time + Talk Time. This report displays information about each Quick IVR node to identify problems, heavy traffic areas, and potential improvements that can be made to call flows. This report can export data to different formats. Parameters include start date, end date, start time, end time, time zone, and call flow name. The name of the node the data describes. The type of node (e.g., CheckQueueState, CheckTime, Enqueue, HangUp, etc.). The option allowed for nodes with user interaction (e.g., Prompt) for sub-aggregation. The total number of calls that went through the node. The average amount of time calls spent in the node. This is calculated as total time spent in node divided by total number of calls that went through the node. The total number of calls that hit the node and did not match user input to a possible outcome path. The total number of calls that hit the node and did not receive any user input when user input was expected. The total number of times the prompt needed to be repeated while attempting to collect user input. This report displays a daily breakdown of calls (by modality) that came in through the system. This report is designed for contact centers that only handle voice calls. The data for chats will not be shown on this report; use the Offered Session Report instead. CompletedAfterHours sessions are excluded from this report. Parameters include start date, end date, start time, end time, and time zone. The total number of calls that went through the platform. Direct proxied calls are included. The number of calls that were abandoned while in IVR. The number of calls that were transferred directly out of the IVR. The number of calls that were placed into a queue to find an agent. The number of calls that were abandoned while waiting in queue for an agent. The number of calls that were transferred directly out of the queue. The number of calls waiting in queue that successfully connected to an agent. The number of calls that were re-enqueued to a new queue. Average Speed of Answer. The average amount of time it took an agent to answer a call. This is a queue-level calculation. Abandon Rate. The percentage of queued calls abandoned before being connected to an agent. This is a queue-level calculation. Average Talk Time. The average amount of time an agent spent speaking with a customer. Average After Call Work. The average amount of time an agent spent on after call work following a call. This is a queue-level calculation. Average Handle Time. The average amount of time an agent spent on a call. This is calculated as Interaction Time + After Call Work Time divided by Answered Calls. This is a queue-level calculation. The total amount of handle time spent on calls that came in from an IVR queue. Talk time + after call work time. This report provides a daily breakdown of calls that came in through Connect by metrics such as abandons, transfers, escalations, and more. Parameters include start date, end date, start date, end time, and time zone. Voice or chat. Voice for escalated calls. The total number of offered calls that went through the platform. Direct proxied calls are included. The number of calls that were waiting in queue that successfully connected to an agent. The number of calls escalated from chat to voice. Average Interaction Time. Average amount of interaction time for all answered calls. This is calculated as Chat Time + Talk Time. This is a queue-level calculation. The total amount of handle time spent on sessions that came in from an IVR queue. This is calculated as Talk Time + After Call Work Time. This report allows administrators to view the most frequently traversed paths through IVR call flows. This can help users gain insight into customer issues and identify potential changes to the IVR that may allow customers to have a more positive experience, such as queueing into the most trafficked queue directly from the first prompt instead of going through multiple levels of routing questions. The report generates a color-coded image of the call flow showing how many times customers passed through a node (Figure 4). The Quick IVR Heatmap only displays one call flow revision at a time. Parameters include start date, end date, call flow, and revision number. This report is different from others as it does not aggregate information. It instead provides a complete data dump of information that can then be aggregated and summarized by customers using whatever technology they are familiar with (Excel, MatLab, etc.) if Clarity Connect’s standard reports do not provide the desired data or aggregation type. The session ID associated with the interaction. This can be cross-referenced with the Session Search page on the administrative website. The date of the interaction. The time the interaction started. The caller ID delivered with the session, either based on context passed in or the telecom provider. The Unique Resource Identifier of the outside party on the interaction. The queue the interaction was placed in. The business unit associated with the queue or the agent’s team in the case of a direct call that was not in a queue. The answering agent for the session. This field will be left blank if there was no answering agent for the session. The answering agent’s team. This field will be left blank if there was no team. The groups that contain the agent’s team. This field will be left blank if there was no group. The session’s modality (voice or chat). The amount of time the interaction spent waiting for an agent to answer the session after being placed into queue. The amount of time the interaction spent with active audio, between when it was first answered by an agent until either a participant disconnects or the session is escalated to include voice. The amount of time the interaction spent on hold (initiated by the agent). This time is also included in talk time and/or message time. The amount of time the finishing agent spent wrapping up their work after disconnecting from the customer, until they placed themselves back to an Available presence state to take another session. If the session was abandoned before being connected to an agent, this is the amount of time the customer waited before abandoning the session, otherwise this field will be left blank. Whether or not the session was answered (Yes/No). Whether or not the session was transferred while waiting in queue hold to the forwarding URI associated with the queue (Yes/No). Whether or not the session was abandoned (Yes/No). Whether or not the session was a proxied direct inbound call (Yes/No). Whether or not the session was a proxied direct outbound call (Yes/No). Whether or not the session was a queued call (Yes/No). Whether or not the session was escalated from chat only to include voice (Yes/No). Whether or not the session was transferred to a different queue or the name of the queue. This field will be left blank if the session was not re-enqueued. Agents that were offered the call and declined or did not answer. This field will be left blank if there were no RONAs. The name of the agent, contact, or URI the session was transferred to. This field will be left blank if there were no transfers. Any additional agents who assisted with the call, as well as the type of assistance provided or. This field will be left blank if there were no additional agents. Any supervisors who silently or whisper joined the session. This field will be left blank if no supervisors silently or whispered joined. The agent-set call disposition assigned to the session. This field will be left blank if no disposition was assigned. The agent-set call sub-disposition assigned to the session. This field will be left blank if no sub-disposition was assigned.